#4201-C Pietenpol Motor mounts, now on the shelf, ready for shipping. These motor mounts are a good example of advancements in our 2016 operations. Over many years, I developed and hand made several dozen of these mounts. They are on many well known Corvair powered Pietenpols, and the design allows the plane to be flown with larger pilots without having aft CG issues common to other engines. The only drawbacks to the mount was that it was difficult for me to meet demand for them, and second, because of builder variations in fuselage width, we ended up making them in two slightly different widths. Both of these issues have now been eliminated, we have filled all the back orders, and we now have these mounts on the shelf, ready for immediate shipping. The second innovation actually came from the mind of Dan Weseman. I was explaining to him how many Piet builders miss the plans specified fuselage with of 24.00″ because they don’t put the plywood on the fuselage until later, and only then discover their finished width is 24.25″. Because of the style of the fuselage attach points, this would normally require two different mounts. 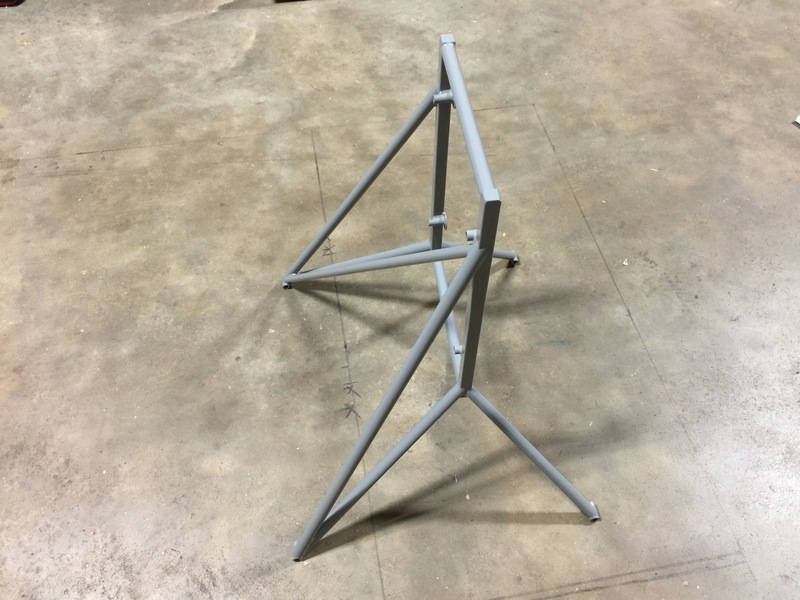 After looking at this for a while, Dan offered the idea pictured below, which allows one mount to cover any fuselage between 24.00-and 24.25″ width. This allows stocking mounts that will serve all fuselages. 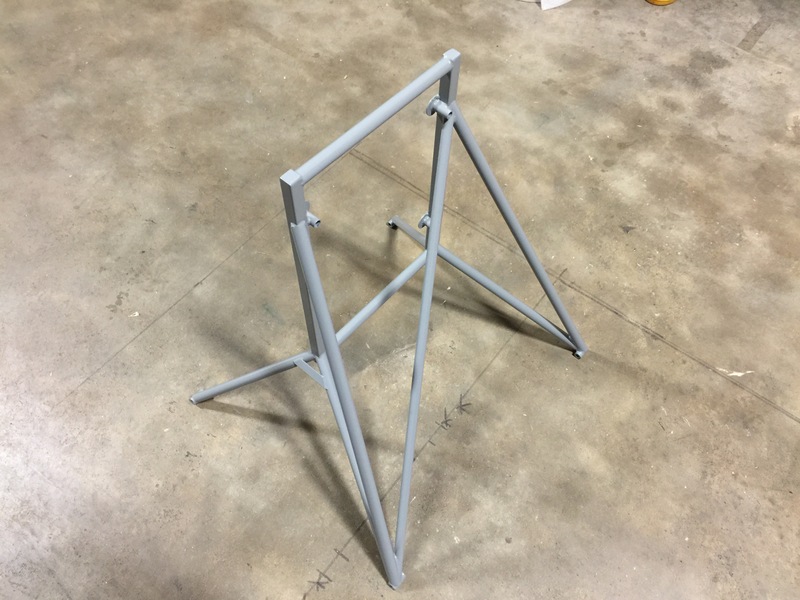 From here forward, we will build several batches a year of these mounts, with the intention of keeping the on the shelf to stay ahead of orders. Right now we have a small number on hand, extras from the first CNC batch that filled all the existing orders. If you are a Pietenpol builder, and you would like to advance your project by purchasing one of these mounts, you can order it directly from the link below to our products page. If you order it today, it can be at your location in 2 or 3 days. That is a serious improvement, and typical of the many advancement we have made in 2016. Above, a top view of the mount. They are all powder coated haze gray. To understand the development of the design, read this story: Three Pietenpol Motor Mounts. Above, the detail that makes it work on both fuselage widths: The mount is held to the airframe with four AN-5 bolts. ( The bolt illustrated is just for reference, it is not the correct length nor is it an AN bolt. ) On each of these four bolts there are two AN-960-516 washers, acting as spacers. 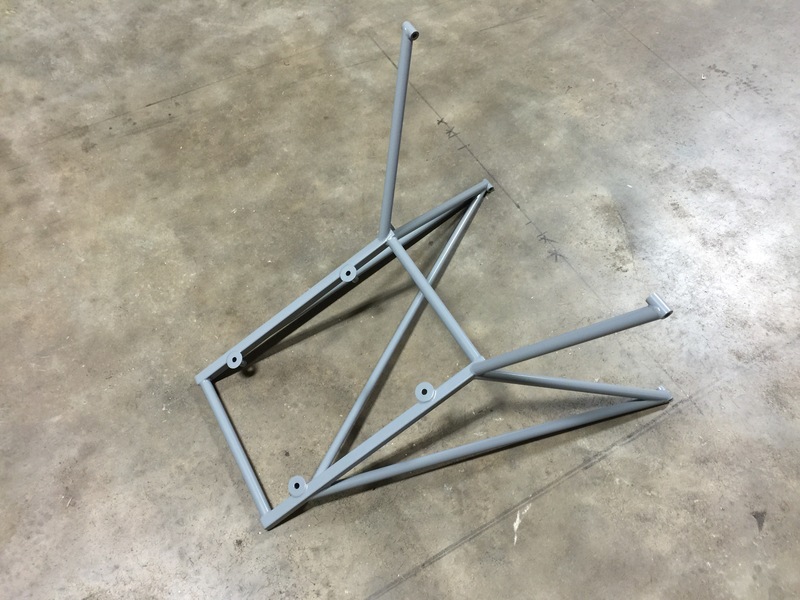 If they are installed as above, on the inboard side of the mount, the mount fits a 24.00″ wide fuselage like a glove. 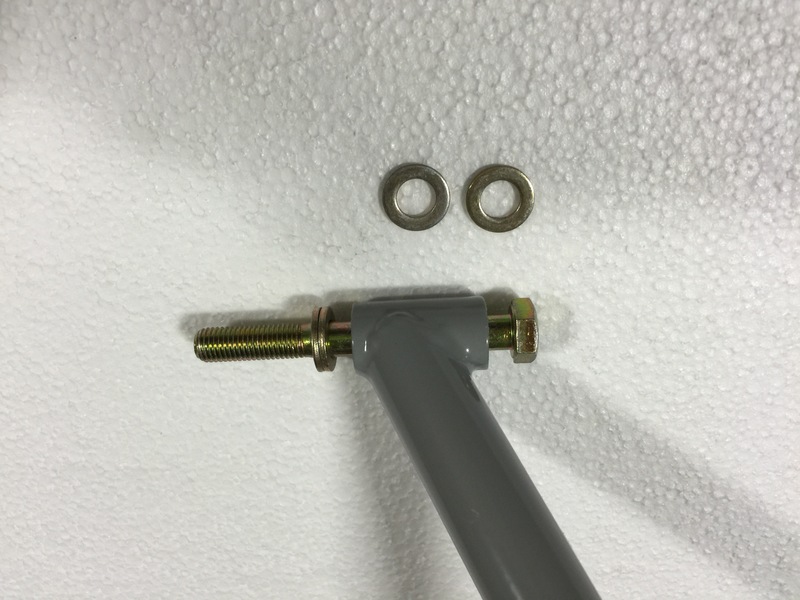 If the washers are installed on the outboard side of the mount, it will fit a 24.25″ wide fuselage perfectly. This even works for the one guy who made a 24.125″ wide fuselage, as he can put one washer on each side. Although this seems like an obvious idea, it has actually been checked very closely on CAD drawings to make sure the tube shown doesn’t contact the ears on the fuselage attach brackets on either fuselage width. A special note to other Pietenpol builders: The 1960s revisions to the Piet plans show a much more elaborate straps and finger patched on the mount legs. If you are building your own mount, particularly if you are not a professional aircraft welder or you are using a gas welder instead of TIG, follow the plans, do not try to imitate the design shown here. What makes it work for us is the fact we are using very thick wall 5/8 tubing for the bolts to pass through, the 3/4 tubing welded to it is perfectly CNC’ed to fit, The material is all US made tubing, it is 100% TIG welded with state of the art machines, and most critically, it is all welded by Travis, Vern or myself. This is not a particularly challenging weld, nor is it highly stressed, but I have seen a lot of guys who say “I’ll get my buddy to do this, he had been welding for 25 years, and he works cheap” and the guy isn’t capable of reliably making that weld, nor honest enough to admit he can’t. If you are not going to get the mount from me, use the style of fitting shown in the plans, not the welding style pictured here. Left side view of the mount. It is 100% 4130 aircraft steel, 100% TIG welded. We have never had any steel of unknown quality (Chinese) in any aircraft mount we have sold. If you are looking at tubing for sale, even in aircraft catalogs, and it doesn’t specify the country of origin, there is a fair chance it is from China. The CNC factory that supplies our tubing kits is the #1 suppler of aircraft tubing kits in the world, I know the owner personally, and he has plenty of evidence to show that Chinese tubing isn’t made to the same standards no matter what it is marked. None of the kits he supplies to any of his customers use tubing from China. Bottom view of the mount. The diagonal brace on the mount is required on a Pietenpol, but not all other Corvair mounts. The requirement is mostly driven by the narrow with of the from of the Pietenpol fuselage. The diagonal tube make the mount very stiff in torsion.